The new Konnext™ OneKube™ Portable Power Strip with USB Charger brings your travel experience to a new standard. From the years of experience in research & development, sales & marketing in offering and developing travel power solutions, the OneKube™ Portable Travel Power Strip with USB Charger combines the most unique features of our best selling items together with the newly developed SmartPlug™ Direct AC Slot. 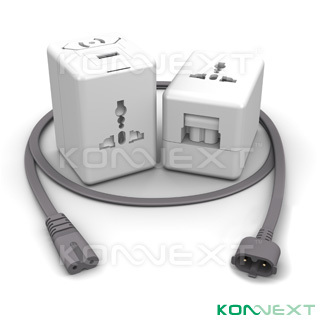 The Konnext™ OneKube™ Portable Travel Power Strip with USB Charger equipped with the all new Konnext™ SmartPlug™ Direct AC Slot offering direct connection to your mobile devices such as notebook computer´s power adapter, DV camcorder´s and digital camera´s charger etc... Completely replaces the AC cord that comes with the device, ensuring adaptability in 150 countries as well as providing a spare universal AC outlet for other electronics. The built-in USB charger provides additional charging advantage for your iPod, iPhone, mobile phones and other mobile devices. Power up your notebook computer thru the SmartPlug™ Direct AC Slot, charge your iPhone with the built-in USB charger and connect your additional electronic devices via the spare universal AC outlet simultaneously in over 150 countries worldwide.